I’m not even sure how to discuss this with a straight face, honestly. 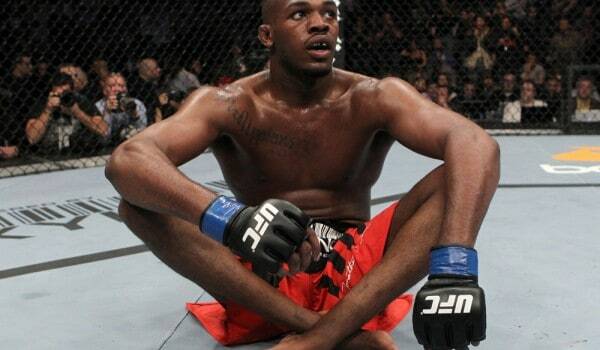 Jon Jones, the UFC Light Heavyweight Champion, has been known to be a bit odd at times. He’s also been known to be a Christian who will talk about Jesus when the moment seems right or he needs to deflect something. Jon Jones is also obsessed with his public image, claim insiders. So when someone started commenting on a “hater’s” Instagram account last night using homophobic slurs the whole thing made zero sense. The fan (or “hater”) in question, a 17-year old Swede, had earlier tweeted at Jon Jones for not taking a fight with Gustafsson. Whomever had access to Jon Jones’s phone at the time then found that kid’s Instagram account and started commenting on photos from the kid’s feed calling him a “fag” and talking about how he was a sinner in the eyes of the Lord. What happened next? Just got a new phone. Changing all of my social media passwords. Apparently I was hacked. 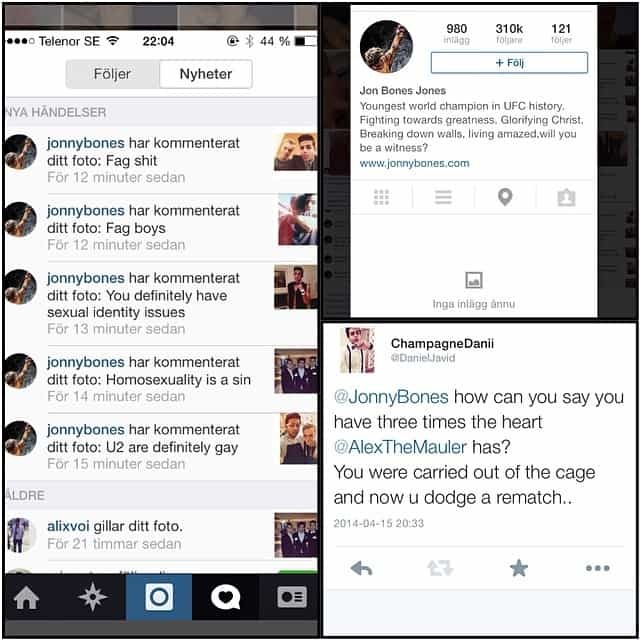 Stories started to emerge about this, then Malki Kawa claimed that someone stole Jon Jones’s phone. Jon Jones stated that he was hacked, so he got a new phone. We are ignoring the elephant in the room that was an Instagram post from the period where JJ’s phone was “hacked” or “stolen” which was an inspirational Jon Jones selfie. The posts have been taken down from Instagram, but there are screenshots to prove it. The whole thing doesn’t ad up if you ask me. The fact that there are claims of being “hacked” and then having his phone stolen show a lack of cohesion in the story, plus the whole Instagram selfie that Jones posted. Sure, it might not have been Jon Jones who posted that selfie. He could have an iPad or tablet, or even someone handling his social media that he doesn’t want to handle. Then there is a further question of was that person posting on his IG account? My question is; who steals a phone then takes the time to defend that person against an attack as opposed to doing a whole slew of other things that you could do with Jon Jones’s phone? You’d have access to his Facebook, Instagram, Twitter, his contacts, his photos, his personal text messages, you’d have everything. If you wanted to make Jon Jones look bad there would be a lot more public, easier ways to do that than on some Swedish kid’s Instagram.